This week's library read was Dear Reader, by Paul Fournel with translation by David Bellos. Bellos' name didn’t register at the time, but I realised later that I've read his book on translation (Is that a Fish in Your Ear) which was fascinating. Highly recommended. I'll start with my very favourite thing about Dear Reader, which is that it's nice to see a book about publishing that isn’t all doom and gloom, and it's nice to see a middle aged male protagonist who does something to cope with the way the world is changing instead of sitting and whining about his actually quite comfortable existence (Disclaimer: It's probable that the latter comment has more to do with the kind of books I’ve read in the last year than books – or indeed middle aged men – in general). Cons: I nearly didn't read it at all purely because it's a novel about a publisher. In my experience novels about publishers are second only to novels about aspiring writers in the navel-gazing-please-move-out-of-your-comfort-zone-stakes. 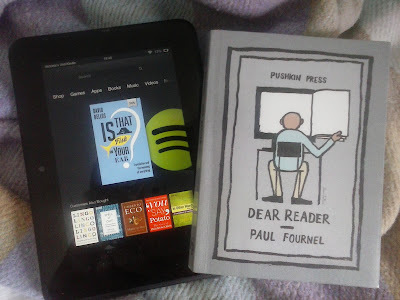 In this case I would have been wrong, Fournel's publisher focusses outwards not inwards; on books and other people, the future of publishing, dinners with his authors, getting a present for his wife. I liked the narrator, I cared what happened to him, the story jogged along nicely and yet.. Yet there was something about the way he put things, some feeling of constraint that I was constantly conscious of but couldn’t identify and which never quite allowed me to forget that I was reading a book rather than entering someone’s mind. I should add at this point that I had not read anything about the book except what was in the book as I've been spoilered so many times before. Of course I couldn’t stop trying to work out what it was that was bothering me. Perhaps something about the way it translated from the French? The choice of words or syntax did occasionally seem odd, not quite as fluid as expected, but definitely not incorrect. Why should that be a distraction? Perhaps it was stilted because the translator was American and trying to sound English? (No. Bellos is English). Was the translation too complete? Did it perhaps just not feel French enough anymore? Then I read the blurb at the end. Ah. Apparently the book conforms to a rhythmic pattern where the same words are repeated at intervals, like a poem (or literally a poem perhaps, if read aloud). A clever trick to perform once, let alone twice in separate languages, but to me a constant subconscious irritation. I admired this book rather than enjoyed it.